No sooner are the schools back than the children’s party season starts again. And with it, all those vexed questions such as where, when and who! My daughter had a 10th birthday party yesterday and it reminded me of all I have learned over the last 10 years or so of organising children’s birthday parties. Thankfully, once children go to secondary school, ‘proper’ parties stop and are replaced by having a few friends round for gaming or beauty sessions plus pizza. So the below is really only about parties from 1-11! This is very important – work out how much you can spend up to, taking into account food and party bags as well as any entertainment or venue hire. Even if you don’t book the venue or the entertainer for a few weeks, it is a good idea to start thinking about what kind of party you are going to have – active (football, laser, outdoor activities etc) or quieter (cupcake decorating, photoshoot etc) and where. Bear in mind though that some venues/entertainers get booked up really early. But two months is usually ok for most and I have got away with less although it does pile on the stress as you can end up with a date sometime after the actual birthday. But you do need to decide what kind of party you are going to do – flumes at the local pool, hire a church hall and an entertainer, a venue where they do everything including food and party bags, games and tea at home. Netmums usually has a good list of local party options. My daughter had a cupcake party this year – worked really well. It sounds obvious but this can be quite fraught, particularly if you are having a small party. There seems to be an unspoken rule that you have to invite the whole class in Infants school and can then start being more selective in Junior School . I always found it a bit mad that you had to invite the whole class but went along with it. But you don’t have to! My friend had a rule that each of her 3 daughters could have 1 large party during primary school and, apart from that, it was friends round for tea. You also need to take into account the venue or entertainer as they will probably have number restrictions and/or the costs will go up if you go over the number included in the basic price. These need to go out in good time so that you get the date in everyone’s diaries before they get too booked up. If you have got behind with everything then text! You can always follow up with a ‘proper’ invitation a few days later. If the venue needs to know what everyone will be eating, don’t forget to include that on the invitation (although with any luck the venue will be able to supply invitations with all the info on already). You need to make a note in your diary to chase anyone who hasn’t responded. Most venues need to know by a certain date how many are coming and what they are going to eat. If you have booked a venue with food provided, hurrah! If not, then you will need to put a party menu together and make sure you have all the food and the time to prepare it in good time for the party. Over the years, I have tried various approaches but I have found that simple food works best. Kids are just not interested in catering flights of fancy and don’t necessarily eat that much anyway. Simple food definitely seems to work best.. For parties with very young children, I have done lunch boxes which are nice and easy as you can fill them in the morning and then just pass them round. For my daughter’s 10th party recently, I provided small rolls (well actually finger rolls halved) that I had pre-split for fillings ( one plate was buttered and the other was plain) plus plates of grated cheese and ham, a tub of hummus, falafel (unusual choice but my daughter loves them), cucumber slices, a small bag of ready-salted crisps each and cocktail sausages. I put it all on the table and let the children help themselves to whatever they wanted. And they did eat quite a lot for once. If you want to do a dessert, ice cream is usually a hit as is any kind of chocolate cake. If you don’t want to overdo the sweet stuff, you could just go straight for the Birthday cake once your guests have eaten their fill of the savoury stuff. Buy or make? I must admit I am not very fond of bought birthday cake so I usually make my own or my Mum makes it as she is a dab hand at celebration cakes. If you want to make your own, then I can recommend Mary Berry’s traybakes. They are really easy to make and taste yummy. For a larger party, I usually cook 2 chocolate traybakes, sandwich them together with Mary’s chocolate icing and then use a Nigella Lawson icing on top. Then you just cover the top in smarties, chocolate buttons or other sweets in a pattern of some sort and there you are. The first time I did this was about 6 years ago at my son’s 10th party when my Mum couldn’t help me out. My husband worked out the design which included my son’s name in smarties. (work out the design before you ice !). The boys at the party loved the cake and crowded round me so much when I was trying to cut it that I couldn’t move the knife. For my daughter’s birthday this year, we cooked a plain sponge traybake (just the one this time), put vanilla buttercream over the top and then scattered mini-marshmallows, silver balls, jelly diamonds and crushed flakes all over. It looked good and tasted great and was so easy.. The recipe I use is in ‘Fast cakes’ but I am sure her other baking books have traybakes as well. Some venues and entertainers provide them as part of the party package but often end up providing my own as well. I do try and keep it simple – a few mini chocs, something to do with the party theme and a piece of birthday cake. There are sites on the internet that will provide pre-filled party bags but I’ve never tried them. Make sure that the presents and cards only get opened when there is an adult with pen and paper present! You need to know who gave what – nothing more embarrassing than having to write ‘Thank you for your present’ to everyone..
Buy or create your own thank you notes. When the children were very young, I used to write most of the note and then get them to sign it – much quicker and less painful for all concerned. Now I tend to get my daughter to write a bit more. Of course, once children go to secondary school, the whole ‘thank you note’ writing tends to stop (hurrah!). The next children’s parties article will be about planning for the actual day such as what to take with you and the order of events. We would love to hear about any of your party experiences and any tips for organising a great children’s party. 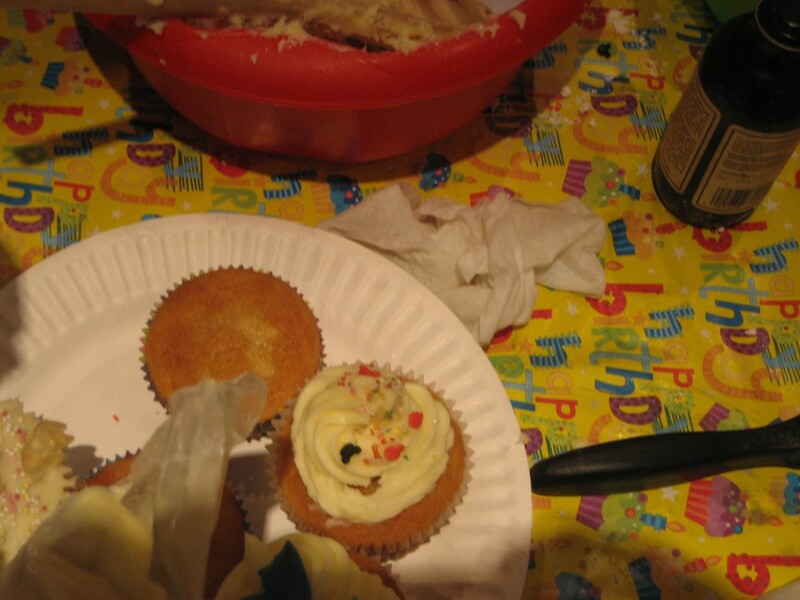 This entry was posted in Organising and tagged children's parties, Get organised, getting organised. Bookmark the permalink.